The Els Club Teluk Datai received the greatest possible endorsement of its highly-acclaimed redesign after being named the region's 'Best Golf Course' at the 2014 Asia-Pacific Property Awards. The recently-unveiled Troon-managed venue recieved the prestigious accolade from Lord Courtown, Chairman of Judging for the Architecture and Interior Design categories, in front of a distinguished assembly of developers, architects, interior designers and real estate officials at the Shangri-La Hotel in Kuala Lumpur. It will now go on to represent Asia-Pacific at the 2014 International Property Awards in Dubai later this year. Designed by South African golfing legend and four-time Major Champion Ernie Els, the magnificent layout will compete against other regional winners from Africa, the Middle East, Europe, UK and the Americas at the glittering awards ceremony to find the 'World's Best Golf Course'. Ken Kosak, General Manager of The Els Club Teluk Datai, was delighted that the golf course recieved such significant recognition only weeks after its official opening in April, which also saw it collect the '5-Star Award' as Malaysia's top golfing venue. "Anyone who is familiar with golf in the Asia-Pacific region knows that there is an incredible variety of golf courses of unerring quality here, so to be named the No. 1 course in the region is an incredible achievement for The Els Club Teluk Datai," said Kosak. 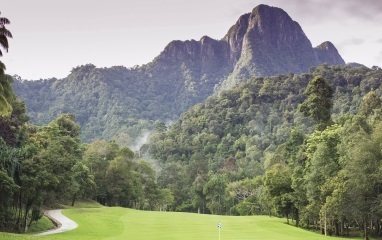 "Our designer Ernie Els has created on of the world's most captivating golfing challenges, taking advantage spectacular tropical landscape here on the island of Langkawi to create something truly unique, which has already recieved widespread critical and public acclaim." The first of two Els Clubs to open in Malaysia, Teluk Datai is without a doubt one of the most intriguing golf course re-designs to open in recent times. Owned by the Malaysian Government-established Destination Resorts & Hotels Sdn Bhd (DRH), the course is nestled within an ancient rainforest featuring towering tropical foliage and blessed with unforgettable vistas overlooking the Andaman Sea. The much-loved region of Teluk Datai is also home to the award-winning luxury resort, The Datai Langkawi, which is internationally recognised for its unsurpassed service excellence. Together with Els’ new masterpiece they will play an integral role in realising DRH’s vision for the development of luxury golf experiences. In addition, Els was selected by DRH to design The Els Club Desaru Coast, located in the southern region of Johor Bahru, completing The Els Club Malaysia portfolio.